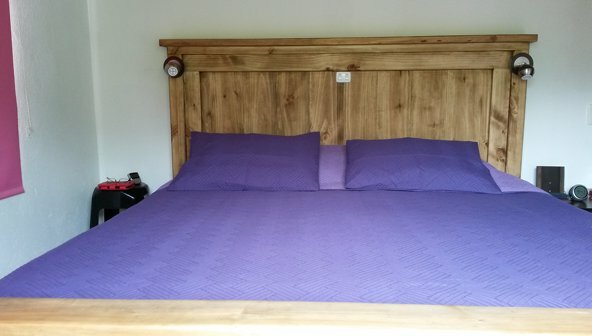 As with many married Couples, I suffered with 'No Room' syndrome, my wife took up all the bed, it was time to try and remedy that, however although we wanted a 2m x 2m bed, our bedrooms didn't allow for that, so the compromise, once we had confirmed we could get the mattress was a 1.8m wide by 1.9m long bed. The problem in Colombia is getting dry timber, I often work her with Mahogany which is used as construction lumber, but is wet, so after trying to source dry hardwood at a price I could afford, I gave up and went for pine. It is made 2x4 and 8x1, using pocket holes to keep the panel boards from springing, the base is 1/2" ply on top of the 2x4, fortunately I was able to buy a sheet of ply 1.83 x 2.44 therefore it is in one piece. I finished the timber with a matt oak varnish, and built in the lights to reduce clutter. The only thing, I am still not entirely happy about, is the height of the bed, my wife insisted it be high enough for one of our dogs (a rescue) to sleep under. I may still make steps for myself!! 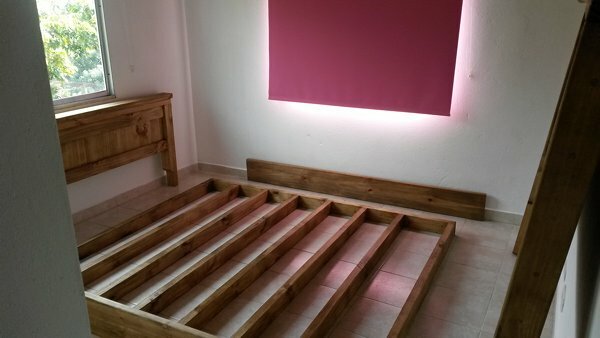 What a great story, and a lovely bed frame, thanks for sharing that with us. I have been yearning to visit Columbia, hopefully one day. Pine can make amazing projects!! I shuddered when you said it wasn't assembled until it went into the room!! You sure had things planned out well! !